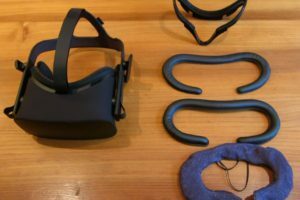 Thinking of adding some VR accessories to your arsenal? 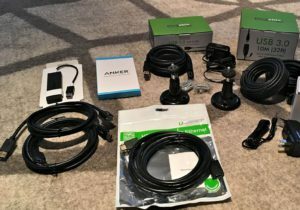 Let me take care of finding the best add-ons you can purchase for your Oculus Rift or HTC Vive (and a few for Gear VR). Few years back I did a similar article on random products you could purchase. Although there were things popping out left and right, you didn’t really have much to choose from. Fast forward to this year, and we are at a much bigger market. These are the ones that either add to your VR experience, improve it, personalize it, or do all at the same time. One of the most annoying things about VR can be cables, especially when you create VR games and you have to hop on and off regularly. Getting the cable either twisted, pulled, or tangled is far too common of an issue. Although we are slowly but steadily working towards cable-less headsets, we are not there yet, so we have to deal with these issues. That system right here is probably one of the most comfortable add-ons for everyday VR usage. Just place those cable rolls to specific place above you, have the cable go through them, and it’ll feel like wireless solution is already here. There is an issue of less cable length if it goes through your ceiling, but that can be fixed by ordering a VR cable extension as well. With this system you can freely rotate yourself, weave, duck, do whatever you want, and your mind won’t have to be worrying about getting tangled. The most comfortable one is only for Oculus Rift sadly. If you want to get one for HTC Vive, check out appropriate products on Amazon. They, however, have much more “pull” due to Vive cable being heavier. You can read this reddit thread about them to get even more information. 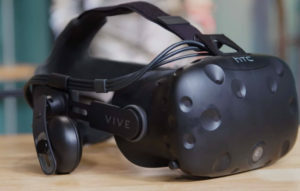 Now I won’t have to speak for HTC Vive users, as it’s not an issue for regular users. But, if you are using Oculus Rift, you can feel the pain, especially now when Oculus Rift has officially started supporting room-scale tracking. Even when I’m using Vive, I’ve had countless of situations where I just lose a picture out of the blue. Reason? I pulled my cables out of the orange box. With this extension you won’t have to worry so much about cables, and if you combine it with my previous VR accessory, cables won’t even be an issue when wireless solution arrives. 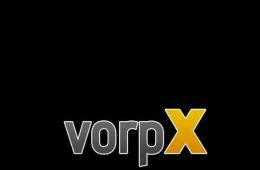 Check them out for sure if you wan’t to play room-scaled games! They have been out on the market for a long time now. I think since 2014 when I made this Rift Info website. I’ve been suggesting for people to buy it then, and I advise them to buy it now. Not only does it have a super comfortable fabric for long time wearing, they can be easily removed for cleaning and washing. There are quite a lot of different companies now selling replacement foams and covers, but I and many others have been quiet loyal to them due to great customer service, great product, and due to how easy it is to use. When friends come over or you’ve been sweating like a pig playing VR boxing games, just take off the previous one, strap the clean one on, and that’s it. At the moment there are different covers ranging from simple fabrics to waterproof ones. You can also choose the color, although limited to some degree. 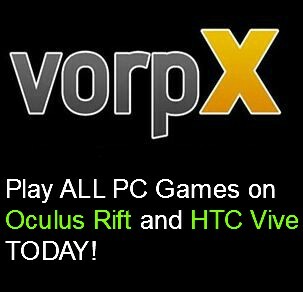 Overall a great addition to your VR arsenal! One of the reasons I liked Oculus Rift a bit more last year, was their excellent solution for audio. Not only were Oculus Rift headphones easy to wear, but they were of superb quality. That’s something that is super important in VR games, especially when playing room-scaled games. Does this Audio Strap deliver? It does, and even more. Sound quality is surprisingly good considering that you only pay 100 bucks for it. Apart from the obvious sound you get, it comes with an improved rigid head strap. You won’t need that old strap that took ages to configure for your potato head. Once you configure how well it fits in your head, you are basically good to go. You can take it off, put it back on, take off, put back on super fast, and even headphones won’t be a nuisance, simply because the foam itself can be tilted to sides really easily. I think developers of different games will appreciate the most of its ease of use. Are they comfortable? Absolutely! First of all, it fits on your head super easily, even better than I thought at first – no pressure on your head, no sliding to the front of your face, and no neck strains due to how light it is. Second of all, you won’t be needing your own headphones anymore. That means the old days where you put on your headset, and then search for headphones is over. Everything is all in one, as it should have been from the beginning. That’s why I appreciated Oculus Rift more back then. If you are using your HTC Vive regularly, I 100% recommend you to get one. Worth the price! Although the default ones are fine, these ones add a lot more customization to your placement. You can place Vive light houses on every bookshelf, on a random tube, on a tripod, and it’ll offer full range of motion without hassle. These ones are actually really high quality considering how low the price for them is. Once you figure out all the screws you need to tighten, they will hold your lighthouse (or Oculus Rift sensor) at a specific angle for a long time. 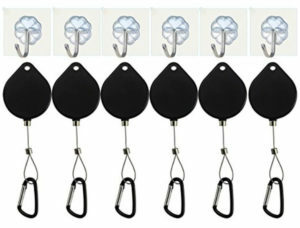 They are quite multi-functional since you can use them with different products. Check them out! Although steering wheels for VR are great, they are not the only controllers that give you immense immersion in virtual reality. 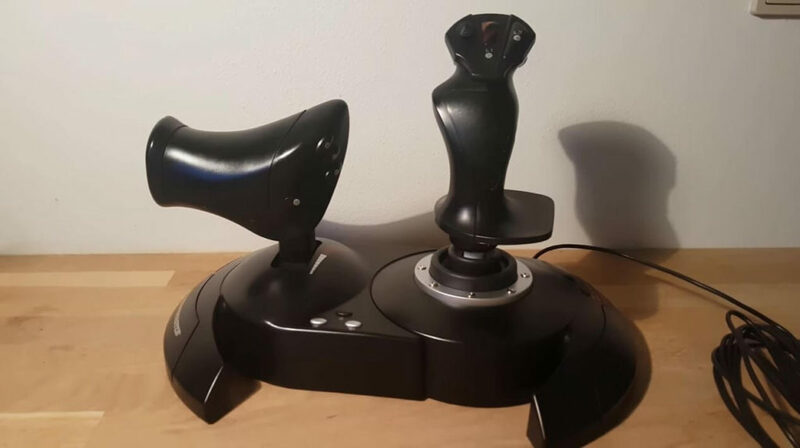 Thrustmaster T-Flight Hotas X Flight Controllers are THE best controllers for flight games, which basically trump every other product by a mile. That can be proven by the amount of people giving it almost MAX stars on Amazon. Not only has HOTAS great ratings, it’s one of the most popular ones out there also. They are mostly made for flight simulators, so combining those games with appropriate controllers and with your VR headset, experience can be truly crazy. Apart from throttle, it has 12 buttons, aerodynamic control, very precise controls, and it costs very little. You can look for something higher in terms of price, but the mentioned controller can do almost everything. Definitely a great product! As with flight controlllers, you will be entertained with a steering wheel. I’ve done some articles about steering wheel and about racing in VR in general, and when you manage to combine these two, you truly are in a different gaming world. It manages to capture real life driving so well it’s kinda scary even. 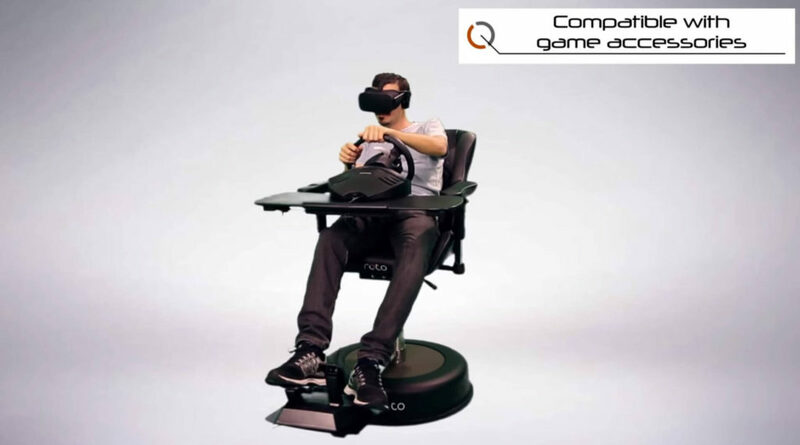 Imagine in two years or less, when VR headsets are going to be high FOV, or resolution twice as high thanks to VR eye tracking, imagine how crazy it must feel to drive a car, feeling every turn, feeling the distance, the speed, everything a normal driver would feel… heck, maybe even inertia to some degree if you purchase Roto VR Chair (more about it below). You will be able to look everywhere you want, and have a complete visual control of you road, and of your car. 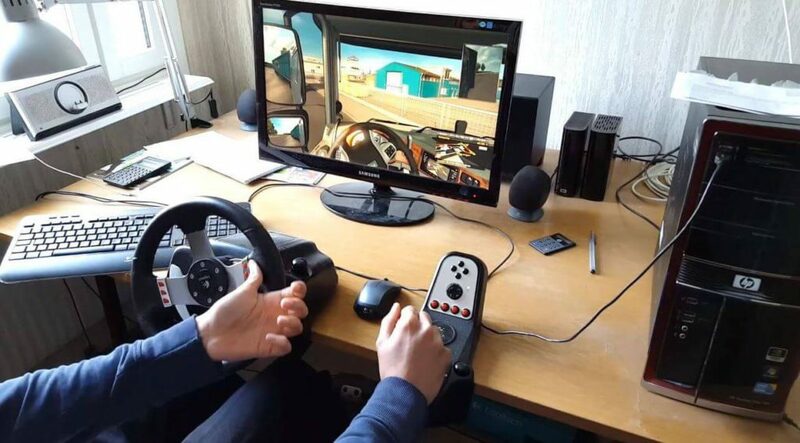 If you are interested in racing games, steering wheel is definitely a way to go. But if you still want more information, check out this article about the best steering wheel for VR that considers your budget. 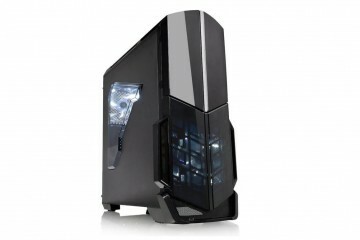 Buy Thrustmaster VG T150 on Amazon. Omnidirectional treadmills can be a headache if you don’t have enough space in your house, especially with all the delivery, but if you manage to fix all those shipping problems, it’s an interesting add-on for your VR rig. One of the problems in VR world is navigating around. Back in 2014/2015, almost everyone was using a keyboard to move in any direction. 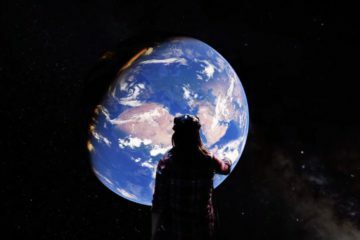 While it was a great and familiar way of relocation, it did create problems with VR motion sickness and summon the feeling of unnatural apprehension that something is definitely wrong. I think everyone here knows what I am talking about. It’s just not right. 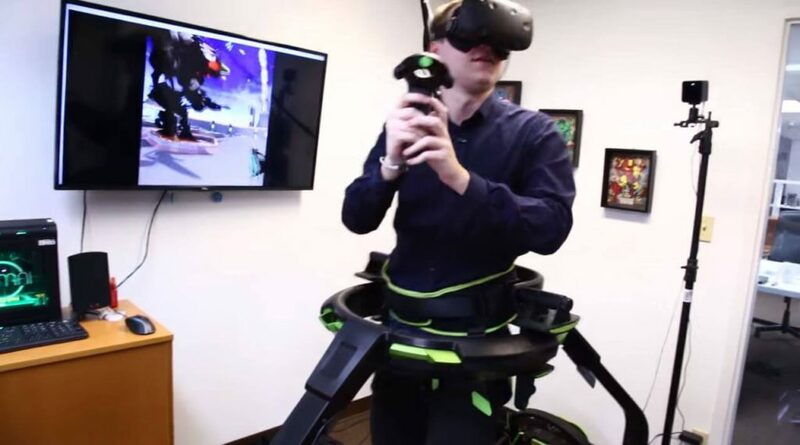 Virtuix Omni here was advocating their product even back in 2014, giving everyone hope for improved VR walking solution. With this treadmill, you could move in any direction you want with your legs, and the straps that you wear, will keep you from losing balance or from walking towards the wall. While it’s a great concept, it’s not yet ready to be welcomed in the mainstream media due to pricing, shipping, and because of how much people love simplicity. It has a limited amount of supported games, so if we combine all these problems, it sadly remains as a niche product for the time being. However, if you have money and space for it, it’s an awesome device. It will take time to get used to it, but once you do, you’ll be craving for more treadmill supported games. Leap Motion has been out for years actually, even before people finding out about virtual reality. In the beginning, it was mostly focusing on hand tracking through regular monitors. You put this USB flash drive looking thing somewhere in front of you – for example on top of the monitor – and by waving your hand around, it tracks your every movement with insanely high accuracy. 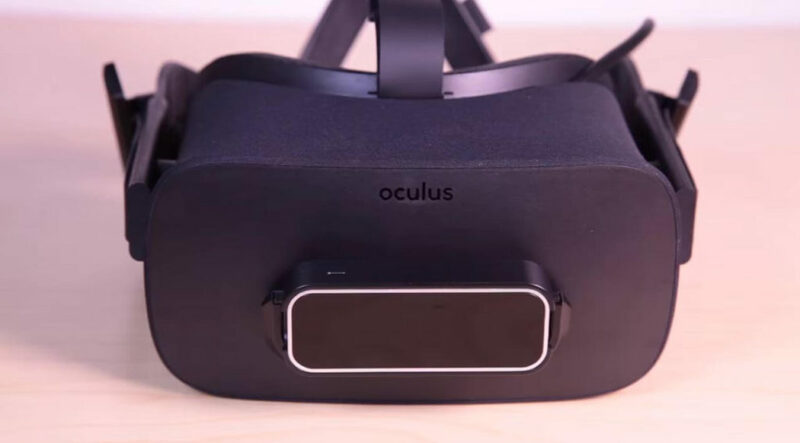 Although it wasn’t doing bad back then, it’s Oculus Rift that made it somewhat popular. 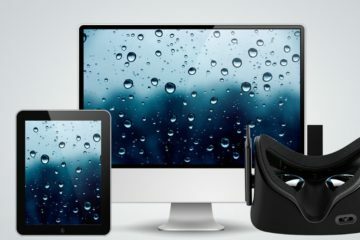 Since Oculus Rift DK1 and DK2 didn’t have any official controllers for movement and interaction, leap motion did manage to ride on the same wave that made Oculus Rift so popular. However, as with many other products, it suffered from a decease called “lack-of-content-idis”. Games that supported such hand tracking were limited in options, and due to these kinds of reasons, it didn’t really pick up. Of course, as time moved on, more content has been made. Heck, if you want, even you can make content for it. But in my opinion, there are still not enough leap motion supported games, so because of that, your options are limited. For more game options with good tracking, I’d suggest to look into Vive Knuckles that will soon be released. But, either way it’s a fun tool which you can even use outside of VR. Give it a go! You want to burn calories the fun way? Well, then you might consider checking out this product. 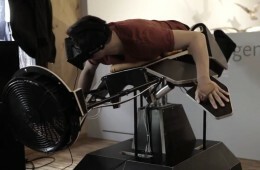 You already burn a lot more calories than an average sitting potato by playing room-scaled VR games, but if we add this stationary bike into the mix, your fitness level rises even higher. 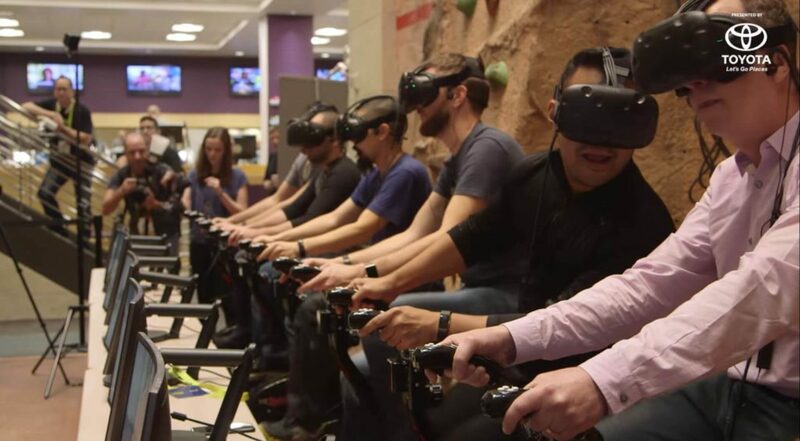 You sit on the bike, you’ll put on the VR headset, you choose a game, and you pedal. That’s it. You shouldn’t really buy this for the games but more for exercising aspect of it. As I am truly a big fan of body training, getting this one has actually crossed my mind more than once. It adds a fun way for people to train, you won’t get bored due to constant interaction in the game, and time flies faster when you play games while pedaling. What games it has, you ask? Well, you can fly on a flying horse, become a tank with a goal to kill others, or be a chopper soaring through the air. These are the kinds of games you’ll find for it. There aren’t many though, somewhere around handful last time I checked. On top of that, it tracks your heart rate and the amount of calories you burned, so all in all, a great way to spice up your cardio training! This one is actually quite interesting. In the beginning I thought it’s just a chair that lets you walk with integrated pedals of something. But as I did more research, I found out it has tons of different uses, and all in one. First of all, it works on all VR headsets. Doesn’t matter if you are on Oculus, Vive, or using a a simple mobile VR headset, you can use it with everything, and cables won’t even be tangled since it has its own separate slot for the VR cable (huge plus in my book). But what I am most interested in, is the fact that it supports other VR accessories like steering wheels or flight controllers. It has its own designated slot for these kinds of accessories, so it’s super easy to install whatever controllers you want in front of you, and it’ll work, with added immersion bonus from 360 degree turning. At this current moment, this accessory is actually my favorite one. 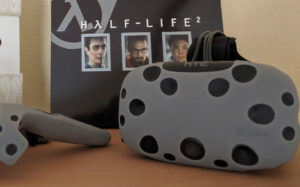 This one is officially coming straight from the Vive makers themselves. What does it do? With this one you can create your own physical objects like baseball bat, guitar, a golf club, gun, whatever, you name it, and use it as a trackable object in VR by having a designated slot for it in the object itself. 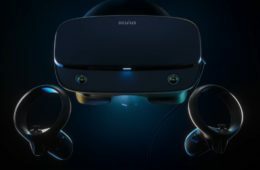 That will let you have an even higher level of immersion since you feel the actual weight and its shape in your own very hands in VR. 2) ship the needed object to everyone who buys their game. That will obviously take time, so at the moment you’ll have to wait for fall 2017 till you get to experience it. Another way of using it is by attaching a camera to it. 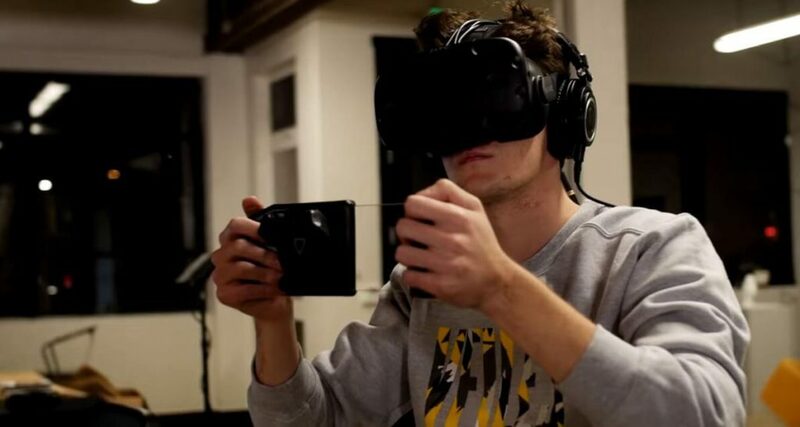 If you know how to make mixed virtual reality videos, you’ll be able to create some awesome footage, be it for your Youtube channel, or for advertising your own VR game. Interesting thing that definitely has a lot of potential in many areas! Best place to buy: Not out yet. 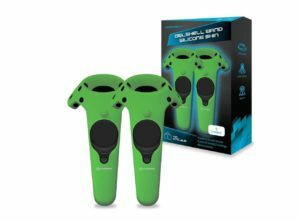 Want to protect your HTC Vive? Afraid of running into a wall someday? Say no more, Hyperkin has exactly what you need! All jokes aside, it’s actually a solid investment if you want to protect it from scratches, or if you might accidentally drop it. I wouldn’t recommend doing the latter, but it does increase the chance of Vive surviving the impact. On top of all that, you can customize your headset to your own liking. At the moment I found colors like red, blue, green, white, gray for it, so you can pick whatever you want. My favorite one is green since I’m into nature recently for some reason, but if you want, go with what others have bought the most – gray! Luckily they give you skins not only for HTC Vive headset, but Vive controllers get their own set of skins also! As with headsets, Hyperkin makes skins for controllers also. And you’ll have the same amount of options in color. I’ve had launched my controllers from my hands more than once when playing VR boxing, so protecting my controllers is even more important than the visuals it provides. It feels super good when wearing it in your hands, and after trying them, you just don’t want to go to its original plastic-y material. A very good choice for everyone in my opinion. You can buy the headset one, and skins for controllers in a bundle. Check it out! As with everything popular that comes out, there are usually some custom skins for it. 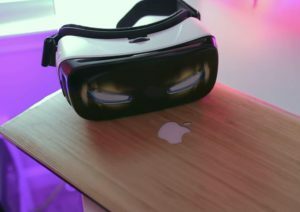 Be it a car, a phone, a computer, or simple VR device, you’ll probably find some kind of skin for it. Gear VR is not an exception. Although these are not made of rubber like Hyperkin ones, and so are not protecting your device from impact, they do add your own personalized character to it. On top of that, it protects Gear VR from additional scratches and wear. It’s a hard case, so it’s fairly easy to strap it on, won’t take much time. At the moment you can find various different skins from Amazon, just be sure to check out related items also. If you don’t like them, feel free to google the ones you want! 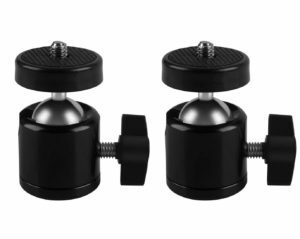 These were the ones that I chose for this VR accessory product compilation. There are many others, but since this article is already getting far too long, I’ll stop at only the best ones. If you think there are better ones, additional ones, or products that have been released recently that improve people’s life in VR, please do comment below! If you want to introduce your own VR products, feel free to contact me through contact page. And as always, please follow and share us, it helps us out a lot! Dude that VR chair is freaking amazing! I love my Samsung Gear VR and always love showing it off when people are at my house. I am flipping out over the steering wheel controller because that sounds super fun. I have a normal controller but a think a steering wheel takes it to the next level. I’ve seen the treadmills in youtube videos and have always wanted to try it. When do you think it will be a more mainstream product? Usually it happens when the price goes down, at the moment we just have to wait and watch everything VR related to drop down in price. May take a year or two.